Donegal swimmer Jake Houck has gotten used to being atop the podium in the 100-yard butterfly. The junior claimed gold and broke the league’s event record at the Lancaster-Lebanon League championships before also winning gold at the District Three championships in early March. Now, Houck also has a state silver medal to his name, having clinched the second-place honor at the Pennsylvania Interscholastic Athletic Association (PIAA) Class 2A swimming championships, held at Bucknell University’s Kinney Natatorium, March 12-14. On March 13, Houck headed into the 100-yard butterfly final as the number-one seed and took the lead in the first 50 yards of the race, but as the swimmers approached the final wall, Houck was overtaken by Belle Vernon’s Ian Shahan by just 0.09 seconds. While Shahan’s time of 48.83 seconds secured him the gold, Houck’s time of 48.92 seconds gave him an impressive new personal record and the silver. Houck also claimed another top-five finish and set a new personal best time in 100-yard freestyle, finishing in fifth with a time of 46.44 seconds. 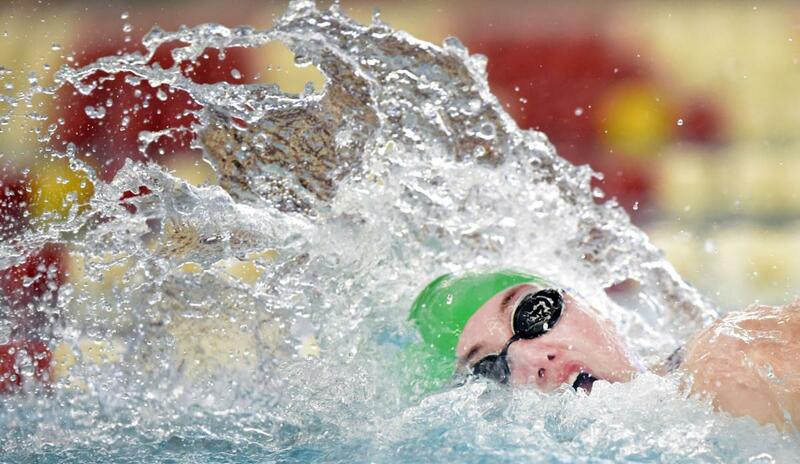 And Houck was not the only Donegal swimmer seeing success in the Kinney Natatorium. Sophomore Jordynn Park finished 13th in the 100-yard butterfly before also taking eighth place in the 100-yeard breaststroke – all while battling the flu, and Park’s sister, senior Jenna Park, finished seventh in the 50-yard freestyle and 18th in 100-yard freestyle. Making his PIAA debut, freshman Ethan Shonk finished 21st in the 100-yard backstroke, while Claire O’Neill finished 13th in the 200-yard IM and 16th in the 500-yard freestyle. Congratulations to all Donegal swimmers!